We’ve written about “event albums” on AD multiple times in the past — we all have them. Every year a handful of the small cadre of artists we closely follow deliver another round for us to look forward to. Here in 2009 the three LPs I am most anticipating, at the moment, are Sonic Youth’s The Eternal, Bonnie “Prince” Billy’s Beware and of course Grizzly Bear’s Veckatimest. The album, the groups first full-length since 2006’s transcendent Yellow House, is presently slated for retail shelves May 26th via Warp Records (see album art/tracklist after the jump). 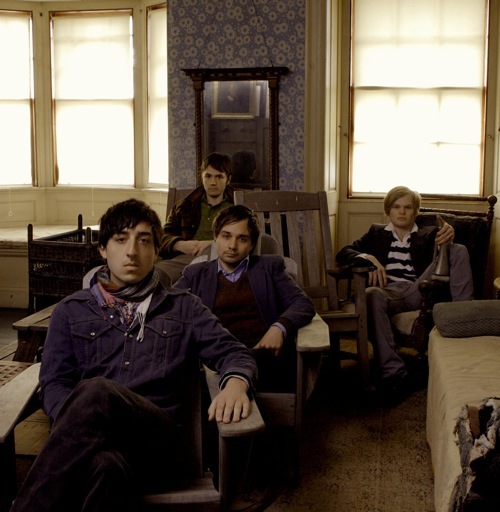 In addition to SXSW, and various festival dates, Grizzly Bear will be embarking on an upcoming tour is support the new record. If you did not catch the group during the Yellow House run, below is a taste from early 2007 in Dallas. Thanks to the original taper. Also, for those who have have been under an internetz rock, you’ll want to listen to the two tracks immediately afterwards. Pitchfork: A lot of the early speculation surrounding Veckatimest has set it up as potentially being your big moment. Do you feel any kind of pressure, like you have to live up to something with this? Ed Droste: I don’t think any band doesn’t feel pressure when they’re releasing an album, whether it’s on a small scale or a giant Coldplay scale. There’s always going to be some pressure and nervousness about how it will be viewed. But I’m excited to be finally releasing something. We certainly take our time, so there’s a little bit of anxiety, but that just comes with the territory. I don’t feel like I have to prove that it’s as good as Yellow House. I think it’s better. I think it’s stronger. But who know what other people will say? Read the full article HERE…. One more album to anticipate – Akron/Family’s Set ‘Em Wild, Set ‘Em Free. I’m currently listening to the first track, and needless to say it is phenomenal and an especially unusual track considering Akron/Family’s justifiably accoladed oeuvre.